as a faie player only the moving to another general’s gameplay was hard to process at first. However the existence of yggdra pushed me over the edge to create a deck that utilize yggdra not only as a tank and control tool but more as a crucial killing force. the deck is not the easiest to pilot, harder then normal wall deck. unlike wall deck you have enough wincons to almost guarantee drawing one in you opening hand opposite to wall decks where you can’t win for sure unless you drew wake or razorback. gameplay is slower and more control given the bbs, the wanted pace is – really slow on the board, fast on the mana. embla/ice age – your main setting for the kill, the cards you want to ramp into by any mean. embla will be used more against aggressive enemies and solo decks while ice age will be best using with good amount of ramp and a relatively good health pool, will do best against slower enemies (wanderer *cough*). wake – give you rocks and walls a soul, legs and anger issues and let them loose on your enemy, classy card, have it in hand? keep it. reflection – this where things gets interesting, using gravity well and luminous charge is almost always a fuel for reflection. and having the best “3” drop vanar has to offer – a very sticky yggdra, will guarantee an early blow out of board and face ( not always a win). if reflected even once or twice – you usually won the game, this is a hard blow to come back from. if we didn’t got lucky we can always reflect.. embla for the same amount of single unit damage but the setting good enough for otk. reflection can also be used with ice age and other walls to reflect backline threats (dancer, decimus, mechazor ) in order to shift the tides, however a good amount of positioning is required. chaser and frigid – your main hand size controller and a good enabler of aotm. 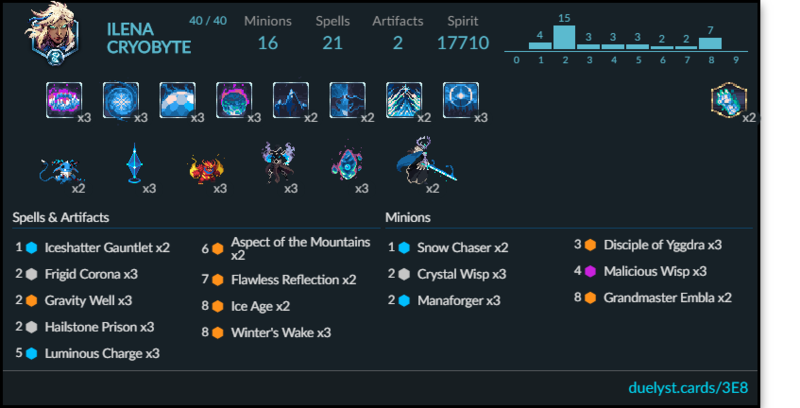 wisps and forger – great ramping tools. yggdra – our secret wincon along with refection and a good amount of stun support and targets around this lethal monster usually left untouched if not in range, which gives us enough time to prepare a good setting for reflection and put our poor enemy general out of his misery. early game – RAMP! gravity well + wisp/ forger/ chaser are all really strong openings so use either one, but i’ll suggest wisp especially if you got your wincons in order or evil wisp in hand. in case of reflection try to fish for yggdra or ice age. while dropping your backline and front line you are the broom to clean out your opponent minions. do get your gloves and march in, close and personal is how ilena rolling. mid game – a very short to non existent if ramped well and kept your forgers alive. you either finished setting for reflection or waiting for your walls to grow legs, either way, this is the time to start clearing and pressuring by gauntlet, luminous charge, aotm, but keep your hand on a healthy size in case of aoe on your wincon. late game – time to get creative. this i’ll leave to you, even if it doesn’t seems like it the picking of wincon setting depends on the situation. Cool deck. I like that it uses a lot of bad cards in a good way. What I don’t understand is that this deck doesn’t have a card I heard of recently called “mythron wanderer.” Isn’t this supposed to make all decks better? We don’t welcome wanderer in these parts. Btw – what bad card? Most of these cards are good vanar cards.